Premises Liability Attorney In Dallas Texas Glenn Law Firm Fights Dog Bites, Slip & Fall, Trip, Chemical Exposure, & Other Property Owner Negligence Cases. The term “Premises Liability” refers to a set of laws that hold property owners and occupiers liable for accidents and injuries that occur on the property, both inside and outside. These claims can range from simple slip-and-fall accidents to injury suffered by an individual on a theme park ride. No matter what kind of injury you have sustained on another person’s property, the Glenn Law Firm is committed to reaching a settlement that is both reasonable and fair. The liability assigned to property owners and occupiers (renters, lessees, etc.) varies based on the laws of each state. Attorneys at the Glenn Law Firm understand Texas law and how it applies to owners and occupiers and can give accurate legal advice on any premises liability case. The legal status of the visitor plays a major role in determining fault in a premises liability case. If you live, work or have any other personal or official business on the property and are present on the property at the consent of the owner, you are protected by law against any danger or negligence that could result in injury. If you are injured on any property and had the legal right to be there at the time of the accident, you need a lawyer. The Glenn Law Firm will do a thorough investigation on your claim and fight aggressively to get you a settlement commensurate with the injury. Persons entering a property uninvited or with less clear legal right to be there may not enjoy the same rights as someone who does, but the law does mandate that property owners provide an ample warning of any possible danger or risk of injury within the premises. If you have been injured on someone else’s property, regardless of why you were there, attorneys at the Glenn Law Firm can advise you of your rights and work with you to obtain any settlement the law allows. These ensure that a property is maintained to be in a perpetually safe condition to all persons who legally enter, free of obvious hazards and in perpetually good repair. These standards place property owners under obligation to take reasonable care in maintaining a safe environment throughout the property for the safety of any legal visitor or occupant. The Glenn Law firm will hold accountable any owner or occupier who fails to alert or warn of any hazardous condition and will determine if the owner had knowledge of the property’s condition prior to the injury. An owner can be found liable for your injury whether the danger was known or unknown at the time of the accident. If he or she was aware of any dangerous condition within the property, stiff civil penalties can apply. Property owners and occupiers are under obligation to first warn of then remedy any problem with the property that can result in injury. The Glenn Law Firm will work tirelessly to determine whether the owner knew any danger existed before you got hurt. Your attorney will then act swiftly and fight aggressively to obtain the maximum judgment allowed by law for your injury. The overall reasonableness of the state of repair of the property at the time of the accident. If you feel that any of these standards were breached at the time your injury occurred, call the Glenn law Firm. Talk to an attorney for free about your case and they will, in turn, advise you of your rights and help you on your way to recover any damages to which you are entitled. Owners of any type of property are liable for preventable injuries sustained on their premises. If you or someone you know has sustained a brain injury resulting from a slip and fall accident at someone else’s home or business that was the result of the owner’s negligence, don’t assume that the owner or insurance company will compensate you reasonably or fairly. Educate yourself. Know your rights. Call a legal firm that will hold the negligent party responsible and who won’t give in to a lesser settlement. Slip-and-fall accidents can occur as the result of wet floors, missing or misplaced hazard warning signs, loose carpeting, objects or obstacles in common passageways, poorly designed stairwells and banisters and many other avoidable situations. 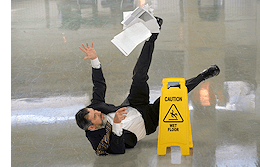 After suffering a slip-and-fall you may need to contact a Dallas Brain Injury Attorney to discover the cause of the accident and to hold the property owner responsible for failing to maintain a safe environment on their premises. Call us at 817-424-5999 contact us online to arrange a free consultation with an experienced Dallas-Fort Worth personal injury lawyer. We bill on a contingent fee basis. In other words: no recovery, no fee.